The flowers are edible with a lighter anise flavor than the leaves and make for a tasty and beautiful garnish or addition to a salad. Truly beautiful for tea parties. It adds a delicious licorice flavor to many sweet foods and drinks too. Think: hot chocolate, cookies, and candy. The leaves and flowers make a delicious black licorice flavored tea that also has some medicinal benefits. In The Green Witch Herbal, the author states that hyssop helps expel mucus making it ideal for treating colds. Susun Weed, too, suggests that it is good for relieving congestion. To dry, simply hang the stems in a dark place until crispy and then store in airtight containers. Hyssop is a traditional ingredient in absinthe and makes for a tasty homemade infusion. Fill a jar half full with fresh leaves and fill the jar completely with vodka, cover and let sit for a month. Stain the leaves and sweeten the vodka with a sugar syrup to taste and you have a wonderful anise flavored dessert cordial. Put fresh or dried leaves in a square of cheesecloth and hang from the tub faucet, letting the water flow over the herbs. The scent from the hyssop will help calm frazzled nerves. Traditionally it was also used for pain relief, so soak those sore muscles in an anise hyssop bath. 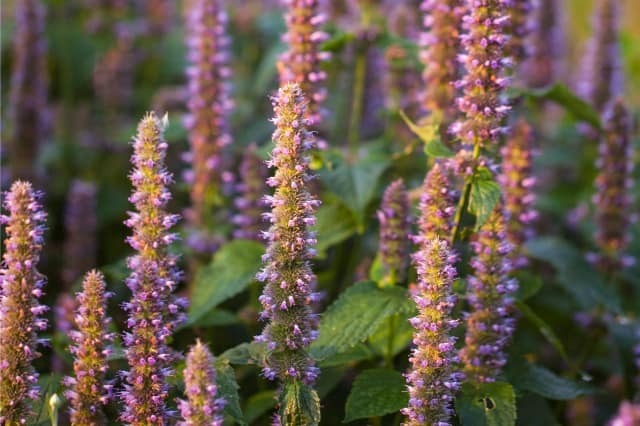 Anise hyssop is supposed to stop nightmares so add some to dream pillows to encourage sweet dreams. What's your favorite way to use anise hyssop? I have the Green Witches Herbal and I greatly enjoy the writing but over the years I’ve discovered that her recommended medical uses are not always correct. Therefore I always cross reference with the various other books I have. In Breverton’s Complete Herbal, the author quotes an herbal from 1525 that suggests using anise for digestive upset. Breverton also states that common use was to chew roasted seeds after a meal to freshen a person’s breath. In Herbal Recipes for Vibrant Health, Rosemary Gladstar suggests using anise for colic or other digestive upset. She also recommends adding a small amount to less tasty herbs (feverfew is one that comes to mind) just as you would peppermint. Thank you for that info, I have a few of Rosemary Gladstar’s books too and she’s so very wonderful. 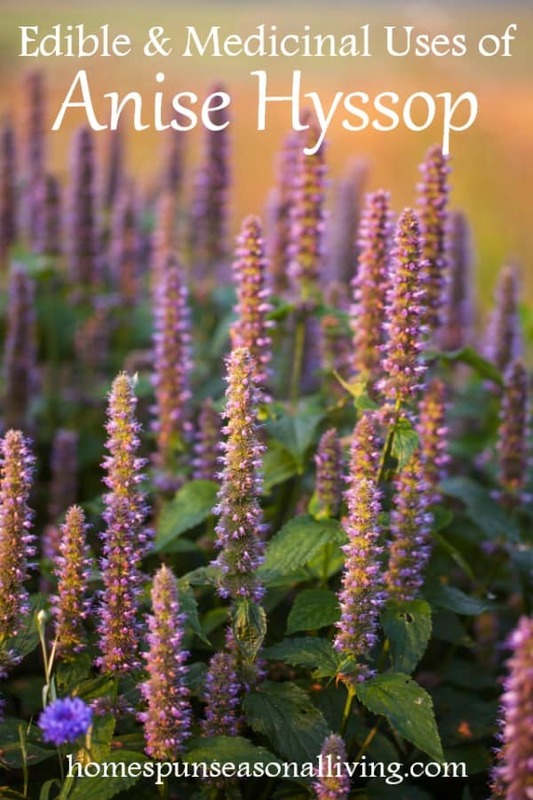 Susun Weed also suggests anise hyssop for relieving congestion: http://www.susunweed.com/herbal_ezine/August11/nourish-yourself.htm – so the Green Witch Herbal seems to be accurate in this case. I love the dream pillow idea! Is it safe for young kids (under 10)? I might try it with my son who has trouble sleeping. The plant is safe for kids. I’ve read that the essential oil isn’t if consumed. Putting the dried leaves in a dream pillow should be just fine as long as there are no allergies. Bees love anise hyssop so it makes a great pollinator plant in your veggie garden. The white, blue, and pink varieties refered to are a different (actual Anise) plane. Anise Hyssop – the purple-flowered plant here – is in the mint family, NOT an actual anise plant. Do not expect same health benefits as you would from anise. The article quite clearly states that anise hyssop is in the mint family in the very first paragraph. And you can buy cultivars in the different colors. Most likely hybrids but still available and accurate. I love this plant. Like you stated, I make tea with the leaves. It is fantastic for congestion. Very nice article. I love anise hyssop and grow a ton of it. I only have purple flowers but have seen the white ones once. I use this to make tea, boil it with apple rinds to make a nice smell throughout the house, as well as use it to make candies. Wow. How do you make candles with hyssop? You must be very talented! How would you use the hyssop leaves for an infection on a limb? Is it safe to use on a wound from a carcinoma? I wouldn’t use anise hyssop to treat infection at all. I would seek local advice from an herbalist for your particular case. I’m using anise hyssop as a main ingredient in salads since I have so much in my yard and I love it. Pesto is delicious also. I prefer the taste when I chop the ingredients by hand: garlic , nuts of choice (walnuts, Brazil nuts…. ), fresh anise hyssop leaves, Romano Pecorino, olive oil. I often add tangy wood sorrel or lemon sorrel to balance the sweetness of anise hyssop.